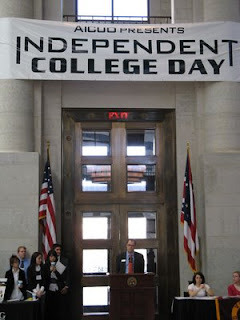 AICUO's First Annual Independent College Day drew over 140 students and their advisors to the Ohio Statehouse to lobby their Senators and Representatives. Students had the opportunity to meet with legislators from their hometowns and those that represent their institution. Colleges also filled the Statehouse Atrium with displays from their colleges featuring projects of pride - from solar speedboats to a Sim Baby.